Introduced in the 1940's, Prosopis juliflora (Sw) dc has proved to be a promising species for the driest zones of the Northeast's Semi-Arid Region, being one of the rare species which occur spontaneously in arid-tropical zones with annual rainfall below 100 mm. In the Northeast it is an outstanding plant, according to Correa (1926), for the arid, rocky and dry lands, in which its potential for reproduction and spreading is enormous, quickly occupying any area given over for it to spread on. The high economic value resulting from this ready adaptation has been duly taken advantage of and, according to the author, there exist today in Hawaii and Sri Lanka P. juliflora forests, covering steep arid mountains previously denuded of vegetation. In Rio Grande do Norte, as throughout the Northeast, it grows well in all types of soils, from the richest to the poorest. Of great rusticity, P. juliflora presents characteristics that justify its use in the most critical areas of the Northeast. Azevedo (1959) cites some of them: Resistance to drought, without losing any of its leaves during the long dry season; high nutritional value, especially of its fruits, which are good fodder; it is palatable to almost all species of domestic animals, particularly bovines, equines, ovines and caprines; it becomes a tree of regular proportions within 3 years and offers a great mass of food (green foliage and fruit). “For Rio Grande do Norte's dry zones, where everything dries up and disappears in the dry season, it would be a true gift from Heaven if P. juliflora were to occupy the plateaux and flatlands, thus providing herds with green forage from its branches and concentrated fodder from the fruit” (Azevedo, 1959). “The great virtue of P. juliflora lies in its being evergreen and bearing fruit even in the driest season of the year” (Marcílio Junior, 1960). “It is convenient to plant it by the tens of millions in poor and low-rainfall lands. It will change zones without vegetation into green and highly productive forests, even in the driest months of the very dry years. It will vastly improve the microclimate. It will largely solve the problem of lack of fodder during the annual dry season and during the prolonged droughts. It will make possible the existence of intensive and highly profitable dairy farms, at sites where the conditions for agriculture are marginal. It will stabilize sand dunes and turn them into profitable agricultural areas. It is the most suitable tree for urban forestry and for municipal forests in the cities of the Semi-Arid Region” (Gomes, 1961). “Although we always regard with great reservations the urgency with which attempts are made to introduce certain plant species in the country, we must state that, in the present case of P. juliflora, there is no qualm regarding the government's intentions with respect to the spreading of this valuable plant in regions of xerophytic vegetation in the Semi-Arid Northeastern region” (Guerra Filho, 1963). “Every city ought to have a mixed municipal forest where P. juliflora were numerous. Under their canopy temperature becomes less hot and more pleasant” (Carvalho, 1963). “P. juliflora will form an evergreen forest even in the driest zones of the Northeastern Semi-Arid Region, in years of little rainfall, as well as in years of periodic drought” (Gomes, 1964). “P. juliflora, along with cactus, will change the Semi-Arid and Sub-Humid zones of the Northeast into one of the biggest and richest dairy lands in Brazil and the world” (Souza, 1965). “P. juliflora is a plant capable of changing the face of the Northeast, either by feeding herds or by providing food to man” (Azevedo, 1965). “When all the other plants in the Semi-arid zone are practically devoid of leaves, one can easily spot P. juliflora with its persistent foliage” (Melo, 1966). “Upon the understanding that only when a certain species has proven its economic value, confirmed by public acceptance, an objective and realistic forest policy can be undertaken, I add my modest opinion to that of others, that P. juliflora ought to be made the basis of that policy” (Borba, 1940). “We have stands or isolated plants in all sectors of the Northeast, a sign that man from the northeastern hinterland has accepted P. juliflora, because it not only gives him shade, but also provides a series of other benefits, including fodder for his herds, which for him is very important” (Borba, 1940). “P. juliflora has adapted very well to the weather conditions of Brazil's Northeast, for it remains green during the hottest and driest months, even where rainfall does not exceed 300 mm per year” (Ramalho, 1972). “Experience has shown, through trees already planted, how beneficial the introduction of P. juliflora has been to our environment. By itself, it does not solve the region's problems. Nevertheless it is a fodder tree which supplies highly protein-rich nutrients, contributing also with its shade to higher yields in the fodder crops associated to it” (Alves, 1972). “We consider this legume to be useful to the Northeast as a fodder tree for improving grasslands, useful for afforesting eroded wastelands unfit for ploughing, and as a covering plant for denuded soils” (Duque, 1980). “The desert landscape that the Semi-Arid Region presents in the period of drought could greatly change by planting P. juliflora” (Barros et al., 1981). “Rational cultivation of P. juliflora may contribute decisively and economically to the improvement of rations for the Northeastern herds and particulary for animals in production such as dairy cows” (Nobre, 1981). Such statements are pointers to encourage governmental action aimed at promoting wide-scale planting of P. juliflora, with the objective of providing a green cover to the Northeastern landscape and solving the acute problem of cattle feed, as well as reforesting and afforesting large portions of the dry areas of the states making up Brazil's Northeast. This long introduction has the objective of providing data on P. juliflora, considering the great interest demonstrated by authorities, technicians and rural producers in this xerophytic legume. It is based on a review of data published in the country and abroad. According to Azevedo (1955), P. juliflora is a tree with a twisted stem, flexible branches with long, strong thorns, bipinnate leaves; pale-yellow flowers arranged in spikes; flattened fruit, nondehiscent with hardened epicarp, pulpy sweet mesocarp, multi-seeded and curved. Valdivia (1972) gives a more detailed description of P. juliflora, stating that it is a tree typical of arid and semi-arid regions. The root system includes a tap root that grows deeply downward in search of water tables; the stem is green-brown, sinuous and twisted, up to 6–9 m in height and 45 cm in diameter, with strong axial thorns situated on both sides of the nodes and branches, from 63 mm to 2.5 cm; bark somewhat rough and dull-red; leaves compound, bipinnate with one or sometimes two pairs of rachis, each having 12 to 25 pairs of green folioles, almost pendulous; flowers lateral to the axis, with a tubular light greenish-yellow 1.5-mm-wide calyx with 5 hooded teeth, a light greenish-yellow corolla composed of 5 petals, 3 mm wide, pubescent along its edges; 10 orange-colored stamens spread lengthwise and 4-mm-wide brown anthers at their end with a thin, white curved style, superior 4-mm-thick ovary, slightly pubescent, light green; the fruit is a nondehiscent pod, curved, approximately 4 mm thick, 1 cm wide, up to 15 cm in length, made up by a light yellow hardened epicarp, fleshy mesocarp, rich in saccharose, whose contents oscillates between 20–25% and 10–20% of reduced sugar and a woody endocarp which contains the seeds. The reports published up to the present regarding the origin of P. juliflora are far from being conclusive. Although the country of origin of this legume tree is not known exactly, Gomes (1964) states that it is native to Peru, based on existing literature dating back to the 16th century. Carvalho (1963) and Azevedo (1965) state that this species originated in Peru, Chile and Argentina, since the primitive inhabitants of those countries prepared several types of food from its pods —called algarobas—, as observed by the Spaniards when they arrived in South America. On the other hand, Duque (1980) asserts that P. juliflora could be found in areas extending to almost all the warm regions of the Americas. Being originally from Chile, according to the author, it spread to Peru, Mexico, South-Western United States, Northeastern Brazil, India, South Africa and Australia. Costa et al. (1973), quoting Fischer, report that P. juliflora is found in dry zones of the United States, Central America, the West Indies, Peru, Argentina, Iran, India and Hawaii. According to Burkart, quoted by Azevedo (1955), there are approximately 40 species of Prosopis distributed throughout Asia, Africa and America. Our continent has the privilege of having the largest number of species, covering a vast area from the Southwestern United States to Patagonia, according to Guerra Filho (1963). Little and Wadsworth (1964) also inform on the existence of 40 Prosopis species growing spontaneously in Southeastern United States, Southern Mexico, Central America, Colombia, Venezuela, Southeastern West Indies, apparently introduced in the Bahamas, from Cuba to Barbados, Trinidad-Tobago, Bonaire, Curaçao and Aruba, Hawaii and the tropics of the Old World. The authors also point out that in Puerto Rico, P. juliflora exists in the form of dense forests in warm and dry zones of the southern coast, also being found in Mona, Santa Cruz, St. Thomas and Tortola, Panama, Jamaica, Nicaragua, El Salvador, Argentina, Brazil, Uruguay, Chile, Bolivia and Peru. There are no references regarding Prosopis native to Brazil. The introduction of the species in Brazil's Northeast, according to Azevedo (1955), occurred around 1942 in Serra Talhada, Pernambuco, and was made by Prof. Griffing. Subsequently, in 1947 in Angicos, Rio Grande do Norte, it was introduced by the Companhia Brasileira de Linhas de Coser (Brazilian Sewing Thread Company), using seeds brought from Peru by Prof. Harland, and later, in 1948, with seeds received from Sudan. According to Azevedo (1982), the attempt to introduce P. juliflora in the Northeast, taking place in 1942, failed from the outset. The author says, based on the testimonies of Prof. Lauro Xavier, Emmanuel Barreto Campelo and Antonio Correa, that Prof. Griffing had sent P. juliflora seeds to Agricultural Engineer Laudemiro Albuquerque and that the first seedlings were under the care of Lauro Bezerra, also an Agricultural Engineer who, upon observing that the seedlings exhibited an enormous quantity of thorns, immediately undertook to eliminate them, for he could not conceive that in a region such as Serra Talhada, where thorny and aggressive trees were established, another one was to be introduced. So, the first attempt to introduce P. juliflora in the Northeastern Semi-arid had failed. Azevedo (1955) observes that as the plant was being introduced in Rio Grande do Norte, Botanist Kohlmann determined that they were 2 species: Prosopis juliflora (Sw) dc and Prosopis bassleri Harms. Meanwhile, Prof. A. Burkart from the University of La Plata established it as being Prosopis juliflora (Sw) dc. Actually, the existing plants in Rio Grande do Norte seemed to belong to 2 groups: one consisting of slow-growing thorny trees with flexible branches, and the other of fast growing trees with short harmless thorns and erect branches. As Prof. Burkart explained, the differences lie only in the “forms” within the species (Azevedo G., personal information, 1981). Nowadays, P. juliflora is well spread and distributed all over the Northeast in organized plantations or otherwise, indicating that the species has been well accepted by the Northeasterners, providing them with fodder, timber for building fences and livestock pens, shading for pastures and urban forestry. Belonging to a genus that grows spontaneously in America and in some African deserts, Prosopis plants are eminently xerophytic. Of great rusticity, P. juliflora thrives in almost all types of soils under widely varying climatic conditions. It adapts to almost all types of soils, not requiring flat and fertile alluvial lands for its growth, thus liberating such lands for subsistence farming (Alves, 1981). Gomes (1964), after his journey to Peru, reported that he saw P. juliflora successfully growing around Piura, where the average annual rainfall is about 50 mm. He also observed it bearing fruits regularly and forming green forests at locations where the average rainfall ranges between 100 mm, 125 mm and 250 mm per year. Nevertheless, he said that in Peru the rainfall considered optimum oscillates between 250 and 500 mm. Prosopis juliflora remains green and bears fruit even in years of drought. In his study, Correa (1926) states that P. juliflora grows from the coast to altitudes of 100 m, preferring lower quality, arid, rocky and dry lands, where its reproduction and spreading ability is enormous. The species does not withstand sudden changes in temperature, as pointed out by Jucafresca, quoted by Valdivia (1972). The most harmful conditions are low temperatures, fogs, extreme humidity and droughts; frosts, however, are its worst enemy. High rainfall rates, according to Azevedo (1955), make the soil excessively humid and hinder the plant's growth, a fact reflected in the production of fruit, as Alves (1981) points out. Brazil's climate is fortunately not excessively dry for Prosopis juliflora, an eminently xerophytic plant; it adapts readily to the dry and hot regions of the Northeast. In these regions it has shown an uncommon rusticity, as well as an outstanding capacity for development and for bearing fruit. Gomes (1961) observes that Prosopis juliflora thrives well in any one of the four Northeastern zones classified by him as “zona da mata” (bushland), “caatinga”, “mocolandia” (mocó land) and “espinho”, which present the following characteristics: “zona da mata” receives more than 1,000 mm average annual rainfall, vegetation remains always green and there are rivers and year-round streams; the “caatinga” is limited by the isohyetas of 1,000 and 600 mm, streams are semi-permanent, vegetation is represented by tropophytic plants, with good pastures in normal rainfall years, planting of both arboreal and herbal cotton, corn, and occurrence of “carnauba”; it is susceptible to periodical droughts, on average 10 in each century; the “mocó” occurs within the limits of 600 to 400 mm annual rainfall, the rivers and streams are semi-permanent and as a rule it does not have “carnauba”; corn planting is difficult without irrigation, and there is a predominance of arboreal cotton planting (mocó); periodical droughts occur more frequently and intensely than in the “caatinga”; the “espinho” zone receives on the average less than 400 mm of rain per year and has temporary rivers and streams: there is no planting of corn without irrigation and “carnauba” does not occur; the vegetation is represented by cactii and Bromeliaceae, and intense periodical droughts occur. The same author points out that in the “zona da mata” (bush land), Prosopis juliflora ought to be planted only in sandy areas (flatlands and dunes), thus avoiding the low humidity areas. It should be grown in the remaining zones —caatinga, mocó land and espinho—, since in those regions it remains evergreen and is highly productive. Gomes (1961) also suggests that it should be tried in the thick woodlands of the central plateau, as the vegetation of that area is xerophytic, although high rainfall occurs in the region for almost half the year —the other months being rainless. Duque (1980) states that in the arid areas in the Northeast region —comprising the Seridó, the Caatinga, the Sertão (hinterland), the old “Cariris” and the “Curimatau”—, the existing plantations show that Prosopis juliflora has adapted well to our environment. In the driest climates of the Northeast, either in poor soils or rich soils, Prosopis juliflora has shown rapid growth and bears fruit as from 2–3 years of age; this fact constitutes the main key for the Northeast's socio-economic development. Generally speaking, the species does not require fertile soils. It develops well in soils with a certain degree of salinity and accepts those of medium or low fertility, limiting for most other plantings. Valdivia (1972) states that highly fertile soils are not adequate for planting P. juliflora, for in those soils the plant directs most of its reserves to the formation of leaves and branches, a small reserve remaining for the production of fruits —called “algarobas”. He recommends that planting be carried out in soils of medium to low fertility, so as to reduce canopy size and increase pod output. Being a plant that requires few nutrients, fertilizers are not needed. Nevertheless, in order to increase fruit production, the author recommends annual application of fertilizers, depending on soil analysis, using a general fertilizer of 100 kg of super-phosphate; 25 kg of ammonia sulphate; 20 kg of potassium-chloride; 10 kg of iron sulphate and 5 kg of zinc sulphate, according to Juscafresca, mentioned by the author. The quantities to be applied generally depend more upon the age of the plant than upon soil fertility; the minimum yearly requirement may be set at 1 kg for plants one to six years old and 2 kg for plants over six years old (Valdivia, 1972). Prosopis juliflora reproduces through seeds and multiplies itself through cuttings. It is known that the production of P. juliflora pods —“algarobas”— varies widely from one tree to another. When propagated through seeds, Prosopis juliflora presents great phenotypic variability and cross pollination. Thus, on reproduction by seeds, Valdivia (1972) advocates the selection of the most vigorous, healthiest and most highly productive trees, giving preference to the fruits of better quality, while Carvalho (1963) holds the point of view that the seeds should only be obtained from ripe fruits taken from well-formed, vigorous, thorn-free and highly productive adult trees. Therefore the choice of parent plants is fundamental, considering that there are several types throughout the Northeast, some of them not well adapted to local conditions, as Melo (1966) reports. One of the methods used to increase and uniform P. juliflora production in a short period of time is vegetative propagation. With this method, the dioic nature of the plant must be taken into account and it is advisable to take male and female cuttings and plant them alternately in order to insure pollination, since the male trees flower later than the female ones. Research was recently conducted under greenhouse conditions, with controlled temperature and humidity, with rooting of cuttings, a procedure which makes it possible to obtain plants with similar characteristics to those of the parent tree. Souza and Nascimento, quoted by Lima and Galvão (1984), using stump sprout material, obtained 70% of rooting with stakes 11 cm to 15 cm long and 2.5 mm to 4.5 mm in diameter, clipped from the top branches. The authors point out the disadvantage of obtaining cuttings by root sprouting, due to the necessity of chopping down trees. They also tested, with good results, the use of stakes originating from crown branches, 15 cm long and 4.5 cm in diameter. In this case, 100% of the leaves were left in the stakes, which were treated with 2,000 ppm indolbutiric acid (aib), once they obtained 67% of rooting. 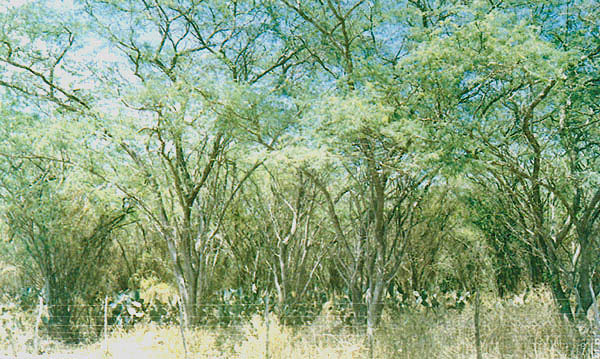 Lima and Galvão (1984) report that the Rio Grande do Norte Agricultural Research Agency (emparn) has carried out research on Prosopis juliflora planting with pseudo-cuttings obtained from seedlings, with approximately the same thickness of a pen, produced in nursery beds and pruned 10 cm above the stem and 15 cm below the “stripling” —bare root to direct sowing. They add that the “stripling” seedlings present satisfactory results in semi-arid conditions and that one of the advantages of this system is the economy in the transportation of seedlings to the planting site. 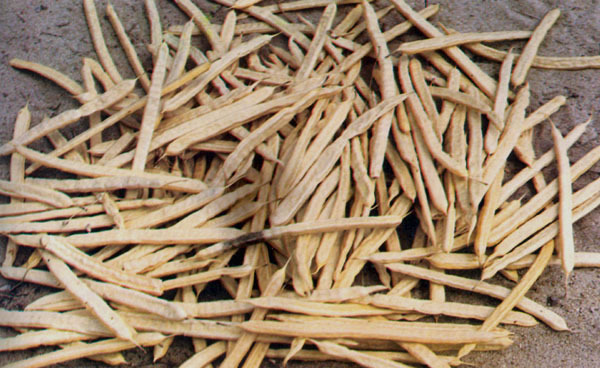 However, the traditional method for establishing any Prosopis juliflora plantation is still through seeds, although it is almost impossible for the new plants to show the characteristics of the parent plants, as Valdivia (1972) points out. This fact, in the countries where the seeds were introduced, resulted in highly hybrid generations. Hence the lack of homogenous production among individuals in the populations of such genus, as Alves (1981) observes. The difficulties in establishing a Prosopis juliflora plantation begin with the extraction of seeds from the pods, since they are embedded in indehiscent fruits of hard endocarp. The results of the tests performed by Azevedo (1955) indicated that germination success was only 20% when sowing seeds with mesocarp, being germination slow and irregular. He attributed the fact to the difficulty for moisture to penetrate the hard cover. The author adds that extraction of seeds is easily done; the pods are cut lengthwise with a small knife and crosswise between the seeds. The inconvenience of this method, according to Barros et al. (1981), is that it is very time-consuming when the amount of seeds to be withdrawn from the pods is large. In Peru the procedure is much simpler. It consists of feeding the whole pod to the animals; the seeds are liberated from the pods during digestion and come out clean embedded in the droppings, in suitable condition for sowing, as Gomes (1981) observes. According to Valdivia (1972), the method is based on the fact that the seeds pass intact through the animal's digestive tract, without suffering alterations which could prevent their germination; the digestive juices dissolve sugars completely, leaving the seeds free and ready for germination. Another method mentioned by Valdivia (1972) consists of collecting P. juliflora pods immediately after physiological ripening, without allowing them to dry on the plant; then, they must be kept in paper bags —“Kraft” type— storing them in a humid place for a month, sufficient time for the epicarp and mesocarp to start fermenting, developing a black mucus that contains spores which consume the sugar present in the mesocarp, thence softening the tissues that protect the seeds. Afterwards, mesocarp residues are washed off with running water, rubbing the fruits between the hands to release the seeds. Once obtained, they must immediately be put to dry in the shade. After drying, they should be stored in a previously desinfected dry place in order to prevent insect infestation. The same author refers to another process studied by Ruiz, which basically consists of the digestion of the fruits by a 5-percent hydrochloric acid solution at a temperature of 30° C.
Research is presently under way in many parts of Brazil aimed at obtaining P. juliflora seeds. In Pernambuco, Pimentel (1982) studied the performance of different concentrations —2%, 4%, 6%, 8%, 10%, 20%, 30%, 40% and 50% — of sodium hydroxide (naoh), i.e. commercial caustic soda, in the extraction of seeds from the pods. The author concludes that the higher or lower strength of the solutions tested does not influence the seed germination rate, recommending the use of sodium hydroxide at 4% strength for seed extraction, for reasons of economy and mainly because this strength does not pose inordinate hazard to the operator. In Pernambuco, Souza et al. (1983) tested manual extraction of seeds; pod immersion in water at 100° C during four, six and eight minutes; scarification in hydrochloric acid for 24 hours; feeding the pods to goats and collecting the seeds in the faeces; grinding sun-dried pods or pods dried in greenhouses at 55° C for 24 hours, in a manual mill, as well as through a fodder machine, concluding that the use of manual mills or fodder machines is the most recommendable method, considering its low operational cost and the fact that it does not affect seed germination negatively. They add that the seeds obtained with fodder machines have the additional advantage of not requiring pre-germination treatments, since this process causes cracks in the tegument, facilitating water penetration. To insure good establishment and uniformity of a P. juliflora plantation, the land must be carefully prepared. The degree of preparation depends on the end use intended for the plantation. In some cases, it will be enough with digging small well-spaced pits (about 5 m from one another); in other cases, clearing, ploughing and grading are necessary. 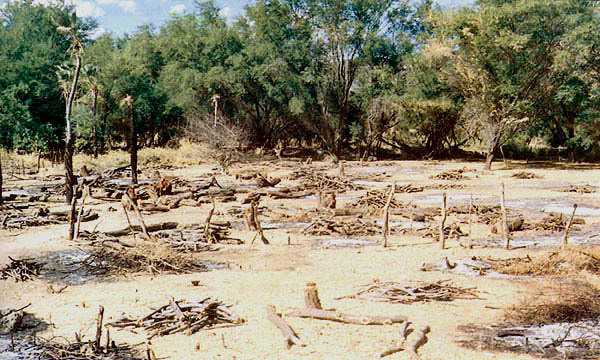 Certain areas need thorough clearing to enable the use of agricultural machinery, as Gomes (1961) observes; others simply need the opening of adequately-spaced furrows and, in cleared ground, the locations of plants that have been removed can be used to place the Prosopis juliflora seedlings (Melo, 1966). Good soil preparation enhances Prosopis juliflora development. In ploughed and graded lands, as a rule, the plants find better conditions for development and in a short time the Prosopis juliflora plantation is formed and producing fruits. After obtaining the seeds by means of any of the methods described above, the next step is sowing. It can be done in ordinary beds (Azevedo, 1955; Gomes, 1961; Carvalho, 1963; Melo, 1966); in “Torrões Paulistas”, i.e. molded soil, clay and manure blocks in the shaped of a pot, (Azevedo, 1955; Gomes, 1961) or directly in the soil (Gomes, 1961; Valdivia, 1972; Melo, 1966). Since the Prosopis juliflora seed possesses an impermeable tegument, preventing the entrance of humidity necessary for germination, before sowing one should look for the most suitable methods of helping germination. Azevedo (1955) advises soaking the seeds in water for six hours, a process giving germination in 24 hours. Nevertheless, the author points out that the beds must be constantly and abundantly watered, because if there is a lack of moisture, the seeds will dry out, affecting the germination rate, this is due to the fact that the germination process has already begun, and should not be interrupted. Another process tested by the same author, with reasonably good results, consists of sanding the seeds with sandpaper. He states that he obtained the best germination results when the seeds were rubbed with sand in a mortar. With this process, the seeds germinated between 5 and 10 days. In the tests carried out by the Seridó Experimental Station, in Cruzeta, Rio Grande do Norte, untreated seeds were compared with sanded seeds, and with seeds rubbed with sand in a mortar, for 10, 15 and 20 minutes; germination rates recorded were 25%, 81%, 68%, 86% and 100% respectively, according to Azevedo (1955). Barros et al. (1981) suggest rubbing the seeds against a ballast covered with a layer of thick sand, which causes thinning of the tegument and subsequent better water absorption, thence accelerating germination, which shall occur after 5 to 10 days. However, they point out that many times the seeds treated in this manner take up to thirty days to germinate. According to Alves (Alves, A. Q., personal communication, 1981), a practical and efficient process to enhance germination of Prosopis juliflora seeds consists of boiling the seeds for no longer than five minutes, sowing immediately thereafter. Sowing must be carried out in common beds, similar to those found in vegetable gardens, with well-prepared soil. Valdivia (1972) advises that the seeds should be covered with a layer of soil mixed with and; this layer should not be thicker than twice the seed's diameter. After sowing, the beds must be watered daily in order to maintain the moisture necessary for seed germination; deficient moisture will make the seeds dry up and will certainly decrease germination rates. When sowing in “torrões Paulistas”, one or two seeds must be sown in the “torrão”, culling the weaker seedling after germination and leaving the stronger one, as Gomes (1961) advises. The manufacturing process of the “torrões paulistas”, according to Carvalho (1963), consists of mixing two parts of mulch, two of clay and one of manure, with a hoe, adding water and mixing again, until the mix becomes similar to that for making bricks, neither wet, nor dry. When the mix is ready, it is left to rest for a day. After this period, the operator grabs the “torrão paulista” machine and dives it into the mix until filling it up. Next, the operator expels the ready “tarrão”, pushing the machine's center beam downwards. After the “torrão” is dry, it may be immediately used or kept for whenever it may become necessary. Gomes (1961) points out that the “torrão paulista” must be shaped long, because the P. juliflora root grows very fast, two or threefold the stem's growth, according to Azevedo (1955). weeding at the planting site has a greater cost. Melo (1966) agrees with Valdivia, stating that sowing directly in the soil is prone to failures, as a consequence of the small size of the seeds. As soon as the seedlings reach a height of 5 to 10 centimeters, the bed must be well watered. The seedlings must be replanted in the “torrões paulistas” in empty cans with one liter capacity, or any other container previously prepared with a mixture of soil and manure, where they shall remain until leaving for their definitive location, according to Azevedo (1955), Cavalho (1963) and Melo (1966). Gomes (1961) states that at the Lambaryeque Tree Orchard in Peru, Agricultural Engineer Baca utilizes the same system. However, when cans are used in this operation, Barros et al. (1981) advise that these be previously opened lengthwise, so as to facilitate soil and seedling withdrawal for planting. When the seedlings reach a height of 15 to 25 centimeters, they are ready for planting at the definitive place. This operation must be made at the onset of the rainy season, for the Northeastern semi-arid region has a short irregular rainy season, during which the plant has to take as much advantage as possible of the favorable conditions to become established. According to Gomes (1961), this procedure insures that P. juliflora will have a root system sufficiently developed at the end of the rainy season to resist well the long dry months to come, not requiring further watering. It is evident that P. juliflora may also be planted at times other than the beginning of the rainy period. Nevertheless, if the onset of this period is taken advantage of, the plant will grow and start producing much sooner, bearing fruit as early as two years after planting, whereas otherwise, in general, fruit bearing starts in the third year (Gomes, 1961). The transplanting operation, according to Azevedo (1955), requires certain precautions in order to avoid damaging the plant. The author states that if the seedling is located in a “torrão paulista”, it is simply placed in the pit; if it is in a can, it is convenient to remove the can's bottom; if it is in a plastic bag, the bag must be removed as the seedling is planted, as Barros et al. (1981) advise. The authors point out that the seedling's roots must be covered with soil up to the stem at planting, since covering it higher than this point may provoke the seedling's death. They also advise to immediately water the seedling after it is planted, in order to insure sufficient moisture and thence plant survival; watering is not necessary if the soil is sufficiently moist, right after a rain. According to Alves (1972), the seedlings may be produced anywhere, indepentenly of region or zone. It is necessary only to study the strategic point for distribution, for as can be imagined, seedling transportation is not an easy task, particularly when the required support to carry it out is unavailable. In plastic bags, the best way of transporting the seedlings is to use a truck equipped with a flat grid table, as Alves (1972) recommends. He also recommends that when the seedlings are placed in “torrões paulistas”, the flat table must be dismissed and the seedlings arranged into a pyramid. Gomes (1961) observes that precautions must be greater when seedlings with bad roots are being transported. He adds that in some cases it is better to remove part of their leaves, in order to reduce the imbalance between water uptake and transpiration. The choice of a suitable spacing depends, basically, on the purpose of the P. juliflora plantation. Azevedo (1955) recommends the following spacings: 2 × 2 meters for timber production and 5 × 5 meters for fodder tree plantations and for fodder trees to be felled. He points out that this spacing allows for the spontaneous appearance of grasses, making animal forage more varied. Duque (1980) recommends planting in pits spaced by 3 × 3 meters for timber production, and 6 × 6 meters for fodder trees. However, he points out that if the pastures have bushy grasses, the distance should be much greater, approximately 10 m.
Alves (1972), on the other hand, recommends these spacings: 3 × 2 meters for timber and stake production; 10 × 15 meters or 5 × 5 meters, for stake production and shading of fodder palm (Opuntia ficus indica), and finally, 15 × 15 meters or 15 × 10 meters for pod production. He also states that at the Pendencia Experimental Farm, Paraíba, there is a P. juliflora plantation with 5 × 5 meter spacing associated with fodder palm, established more than seventeen years ago, in which the Cactacea almost doubled their production and longevity. Alves (1981) states that in P. juliflora planting, the utilization of a 5 × 5 meter spacing, when in association with fodder palm, allows for shading of the cactus and for good pod production, approximately 10 kilograms per plant. Whenever associated to buffel grass (Cenchrus ciliaris L.), the most recommended spacing is 20 × 15 meters or 15 × 15 meters, depending on soil type. Gomes (1961) states that in Peru, P. juliflora is planted at 10 × 10-meter spacing, which permits the growth of grasses during the rainy period. Since pod ripening and falling coincides with the dry period, when forbs are dry and of low nutritive value, the animals, besides eating this vegetation, also feed on P. juliflora pods; this is the season of fat cattle and abundant milk. In the Northeast, according to Barros (1981), P. juliflora planting is also performed with this spacing and the trees seem to produce well. Valdivia (1972) suggests the 10 × 6-meter spacing whenever good fruit production is aimed at; for this purpose, it is necessary for the plants to have a well-formed canopy and good height. Nobre (1981), quoting Azevedo, Guimarães, Duque and Alves, mentions the convenience of planting P. juliflora in association with fodder palm in the Northeastern semi-arid region, for this legume creates micro-climate conditions suitable for growing this cactus in areas where, isolated, its cultivation would be unfeasible. Planted on a level contour, at 2 × 3-meter spacing, it prevents erosion and improves soil organic matter content through leaf litter. For the Northeast, Gomes (1961) believes that P. juliflora must not be planted at a spacing smaller than 5 × 5 meters, recommending this spacing as ideal for the region. Experience has shown, through P. juliflora forests existing in the Northeast, the benefits of growing P. juliflora in the region. 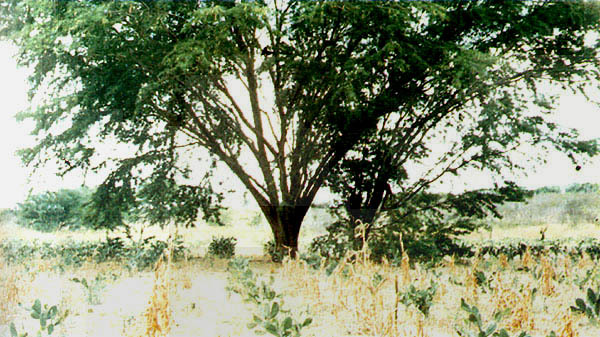 Alves (1972) describes it as a fodder tree which supplies protein nutrients, contributing also with its shading to greater yields of the crops associated with it. In several Northeastern states, P. juliflora reportedly enriches the soil with organic matter, prevents excessive drying up and supplies the soil with nitrogen by means of Rhizobium fixation, creating micro-climate conditions in the area of cactus cultivation. A few research projects carried out in the Northeast demonstrate that nearby presence of P. juliflora is beneficial for fodder palm and buffel-grass. At the Pendencia Experimental Farm, in the town of Soledade, State of Paraíba, a cactus field associated with P. juliflora has achieved a longevity of over seventeen years, with harvesting every two years, while another cactus field not growing under a P. juliflora overstory did not last ten years, according to Alves (1972). With regard to the production of 10 kg of P. juliflora pods per tree, with 5 × 5-meter spacing which provides shading to the cactus, Alves (1981) states that it is possible to estimate an Opuntia production of approximately 60 tons per hectare/year, provided correct cultural treatments are applied during the first year after establishment. In the conventional system, without land clearing and fertilization, production drops to 50 tons per hectare, every two years, according to the same author. Opuntia grows better and stays greener under a P. juliflora overstory. Corn and other crops can also benefit from the tree's shade. Although as yet without conclusive results, the Agricultural Research Center for the Semi-Arid Tropic carries out research on the cactus Opuntia ficus indica associated with P. juliflora, using spacings of 5 × 5 meters; 7 × 7 meters; 10 × 10 meters and 12 × 12 meters for the legume, and 2 × 0.5 meters for the cactus. Lima and Galvão (1984) report that in a demonstration plot for farmers in the Petrolina region, State of Pernambuco, the Agricultural Research Center for the Semi-Arid Tropic, using P. juliflora at 10 × 10-meter spacing associated with Opuntia planted at 3.0 × 1.5 × 0.5-meter spacing, obtained an output of 11.2 tons per hectare (dry weight) of Opuntia in two years. In the clear spaces among P. juliflora and the cactus, sorghum (Sorghum bicolor Moench) was planted, producing 437 and 583 kilograms per hectare in the first two years, respectively. They add that approximately 5 % of the P. juliflora trees started producing pods as from the second year. Souza (1965) reports that the Opuntia plantations growing under a P. juliflora overstory stay more turgid and greener, showing much better development. The author points out that corn and other crops, in Pernambuco's central region, thrive very well under P. juliflora associated with buffel-grass (Cenchrus ciliaris). Alves (1981) recommends 20 × 20-meter or 15 × 15-meter spacing, depending on soil type. Under these conditions, the author points out, an average output of 20 kg of pods per plant over three years old can be expected; C. ciliaris, in turn, may produce an average of 16 tons per ha/year, when reasonably well managed. In order to obtain fast P. juliflora growth without competition from other plants, Azevedo (1955) says that normal cultivation treatments are necessary. Carvalho (1963) advises that the same care should be exercised with P. juliflora as with fruit trees; otherwise, slow growth and little or no fruit bearing may be expected. Melo (1966) points out that in plantings made at Rio Grande do Norte, Seridó, the only cultural treatment was a one-meter-diameter clearing around the plant. Ribaski, quoted by Lima and Galvão (1984), studied the influence of cultural treatments on the survival and development of P. juliflora interplanted with buffel-grass (Cenchrus ciliaris), demonstrating the need of maintaining an area free of any vegetation, with a minimum diameter of two meters, around P. juliflora; otherwise about 80% of the seedlings may die. He also observes that unimpeded cattle grazing in the area may wipe out 60% of the P. juliflora plants within the first nine months, and that the remaining P. juliflora present lower growth in height and crown diameter than those protected behind fences. The important practice with P. juliflora, as Gomes (1961) points out, is to hoe the ground in the first three years. He adds that it is not necessary to weed the whole plot. It is enough with cleaning a one-and-a-half to two meter circle around each plant. Pruning is almost not practiced in Brazil in P. juliflora. Nevertheless, this practice is necessary. Pruning should be performed keeping in mind the purpose or end use intended for the tree. Alves (1972) says that experience has shown pruning to be necessary and that it helps to achieve better results with P. juliflora in the following cases: wood production; recreational forest; urban forestry; shading of highway sidestrips. The same author points out that when pruning is performed from the beginning, the normal practice is to leave only one shoot per tree; if left to grow freely, many branches appear which later may produce stakes, firewood and poles. Therefore, P. juliflora pruning depends on the purpose for which it is planted. In Peru, P. juliflora is attacked by certain pests, such as a coleopteron of the Buprestidae family, which attacks preferably young plants and tender twigs, feeding on their skin and causing the death of the parts attacked; there are two species from the Cerambycidae family, Eburia pilosa Er. and Achryson galapogoensis Lin., which also attack P. juliflora twigs, damaging the skin; the inflorescences are attacked by a leptopteron, Hemiargus ramon Dogmin, belonging to the Lycainidae family, whose larvae live in the flowers destroying pod production. The pods are attacked by a coleopteron belonging to the Anovidae family which feeds on seeds, forming thereafter a mucilage in the outer part of the pods; the pods are also attacked by a fly, Silba pendula Bezzi, of the Lonchaeidae family, which deposits its eggs in the pod; its larvae move towards the interior of the pod in search of seeds in which to grow until reaching the adult stage. Nevertheless, the pest which most damages P. juliflora in Peru is an insect belonging to the Tineidae family, which secrets a mucilage that glues the folioles and among which it lays its eggs. The resulting larvae live off the leaf's tender tissues. This attack is so strong, that on a very short period of time, according to Valdivia (1972), the leaves dry out and fall. In Brazil, the first news of damages caused to P. juliflora by pests was recorded by the Northeastern Agricultural Research Institute (ipean), according to Carvalho et al. (1968). In 1956, in Surubim, Pernambuco, some branches were found which had been “sawn” by insects known as “wood-sawyers” or “sawyers” (Oncideres saga Dalman, 1923); the insect's name derives from the fact that the adult females cut the branches of P. juliflora; when looking at the cross section, it seems as if the branches had been sawn, leaving a perfectly regular cut. They also point out that new information was given by technicians who were impressed with the enormous numbers of P. juliflora branches sawn off, in several parts of the State, where even young plants, upon reaching a height of approximately one and a half meters, were cut by the insects. Later, in 1971, Ramalho (1972) informed that in Soledade, Paraíba, the appearance of sawyer larvae was observed, attacking intensely P. juliflora branches; previously the drop of branches caused by the adult insect had been reported. He also states that this insect's attack has been gradually increasing in the area, and may soon become a constraining factor for P. juliflora cultivation. In 1982, Lima, quoted by Lima and Galvão (1984), observed the presence of and damage caused by O. saga in 3-year-old P. juliflora at Petrolina, Pernambuco. Costa Lima (1985) explains that the female of this insect cuts into the branch by working circularly with its powerful jaws, making a place to lay its eggs. Then, it deepens the cuts until reaching the middle; immediately or a short time thereafter, the branch breaks off and falls to the ground, containing the insect's eggs. According to Bondar, quoted by Ramalho (1972), the “wood-sawyer” is found from North America to Argentina. In Brazil, its presence has been detected in the States of Rio Grande do Sul, Santa Catarina, Paraná, São Paulo, Rio de Janeiro, Minas Gerais, Bahia, Paraíba and Amazonas. In the Northeastern States, this insect is frequently seen attacking not only P. juliflora (Nobre, F.V., personal communication, 1982), but also other species such as avocado, horse-beaters, angico, cashew, ingazeiro, alligator and jurema, among others (Silva et al., quoted by Ramalho, 1972). In order to control the pest's spread, Carvalhio et al. (1968) recommend destroying O. saga larvae and eggs, collecting all fallen branches or those about to fall, and then burning them. They stress that the branches collected should not be kept for consumption, for the larvae would have time to complete their evolution, allowing for the appearance of adult insects which will continue their biologic cycle with attacks on new plants. According to Rodrigues, quoted by Barros et al. (1981), the use of a prepared bait with 5 grams of wheat flour, 500 grams of sugar and 625 grams of chloride camphene and water, has proved effective to check this insect. He recommends the following procedure: place two liters of water in a container and dissolve the 500 grams of sugar along with the insecticide, spread the flour over a flat and impermeable surface, and add it to the mixture in order to obtain good homogenization. He says that O. saga can also be attacked with rhotone and aldrin at 5%. Another method to fight this pest could be biologic control, through a natural enemy which would attack it in the larvae and nymph phase. Carvalho et al. (1968) report that in the state of Paraná there is a little wasp which acts as a parasite to O. saga, according to Friar Thomaz Borgmeirer. Other pests, such as coleopterous and lepdopterous larvae, which live in the ground and feed on roots before starting their metamorphosis, are very difficult to control. An economically feasible measure is to turn the soil and apply insecticides, as Gallo et al. suggest, quoted by Ramalho (1972). Adult coleoptera, according to these authors, must also be controlled when they emerge from the ground. The mode of action and the damages it causes to P. juliflora are still not well defined, other that foliage is the most affected part of the tree. Finally, Moraes et al. 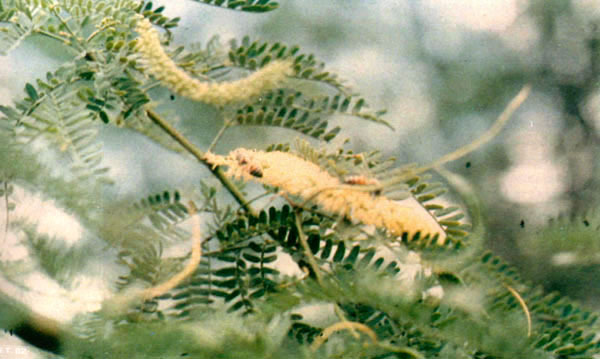 (1981), studying insects associated to seeds in the Brazilian semi-arid region, observed the presence or Bruchidae in P. juliflora seeds, identified as Mimoseets mimosae (F). However, disease cases in P. juliflora are not very common. The only reference in this regard was recorded by Godfrey in 1935, quoted by Pontes (1964), which included P. juliflora as host to a nematode. Based on morphologic studies of the parasite, particularly in the perineal region of several adult females, the author identified the species involved as Meloidogyne halpa Chitwood, 1949, concluding that P. juliflora ought to be included among the hosts to the referred nematode. Recently, Santos and Silva (1983) found that P. juliflora is susceptible to Meloidogyne javanica (Trub 1885) Chitwood 1949, however without affecting seedling survival. In the driest climates of the Northeast, P. juliflora has shown rapid growth and fruit-bearing between two and three years of age. It is worth mentioning that the beginning of fruit production depends on several factors, including the treatment given to the plant, ecology and the individual plant characteristics, as Gomes (1961) points out. P. juliflora fruit production starts nearly always as from the third year, in branches over one year old, according to Valdivia (1972), who adds that production tends to increase with plant age, peaking between 15 to 20 years or even much earlier, provided it is well managed. P. juliflora usually starts to bear fruit as from its third year of life. Under normal conditions, a maximum output of 15 kilograms of pods per tree/year has been observed. There are, however, some P. juliflora throughout the Northeast which produce 100 kilograms or more per year. Carvalho (1963) reports that on the banks of the São Francisco river, in the city of Belém, Pernambuco, isolated P. juliflora growing on deep alluvial humid soils produce some 200 kilograms of pods per year. In Picuí, Paraíba, one P. juliflora tree produced 300, 380 and 420 kg of pods during the years 1977, 1978 and 1979, respectively (Nobre, F. V., personal communication, 1982). But the fact is that there are only a few farmers with organized P. juliflora plantations. In the state of Rio Grande do Norte, farmers from the towns of Campo Redondo, Lagoa dos Velhos and São Tomé collected 1,500; 1,800, and 2,200 kg of pods/ha in 1981, respectively (embrater, 1981). Basing on available information, an output of 6,000 kg of pods/ha can be expected from a fiveyear-old P. juliflora plantation. A good plantation may produce up to 10,000 kg of pods/ha. Production per hectare and per year varies from one country to the other. In the north of India. Brown, quoted by Duque (1980), reports that a good P. juliflora produces 80 kg of pods/year; in Peru, in native P. juliflora fields, Gomes (1961) states that an output of approximately 6,000 kilograms of pods per ha/year is estimated, and in the southeastern United States there is an annual output of approximately 8,700 kg of pods/ha, according to Walton; Valdivia (1972) estimates that in Peru the annual average pod production per tree is approximately 50 kg, with a yield of 5,000 kg of pods/ha, considering a stocking rate of 100 trees per hectare. In the world and in Brazil, particularly in the Northeast, no estimates have been made regarding the average pod output per area unit. However, high output levels have been recorded in isolated plants or even in plants picked out from within a population. Considerable variation has also been detected among individuals, from very high volumes to zero. Lima and Galvão (1984) report that in the Northeast of Brazil, 15-year-old plants growing in the same area and plot showed pod outputs ranging from 5 to 111 kg. Alves (1981) believes that the lack of homogeneous production among individuals is probably due to the great number of introduced species, which give rise to highly hybrid generations, with a negative influence on pod output. In Brazil's Northeast there are P. juliflora plantations bearing fruit as from the second year, although pod production normally starts in the third year, between November and December, and may last until the onset of the rainy season. In absence of rain, Alves (1972) says, P. juliflora shows no visible physical alteration, being the animals able to feed on it at any time of the year, fodder posing no health hazard. Direct browsing of P. juliflora by cattle in the field, the author suggests, constitutes a practical and economical way of feeding animals. Naturally, the animals ingest both ripe and unripe pods, snatching them before they drop to the ground or picking up the dry ones from the ground. The same system was used in the late 18th century by those living at the then-Peruvian Tarapacá province, who took their herds of sheeps to the P. juliflora fields, where they fed on the pods and gained weight. In Peru, it is common at the time of pod ripening, and falling in P. juliflora stands with 10 × 10-m spacing, to have beef and dairy cattle eating dry grasses of low nutritive value found within the P. juliflora stand, as well as fallen pods (Gomes, 1961). As a rule, pod harvest is an extremely easy but costly operation. It consists of manually collecting the pods directly from the plants, together with those naturaly fallen to the ground. preservation of food of high protein value. P. juliflora pod storage is necessary to conserve the fruit for some months and even years. In Peru, according to Gomes (1961), the pods are conserved using various systems from one to three years in good conditions for animal consumption. The most common process is to store the pods in a storage room consisting of a brick room isolated from the rest of the house. Dimensions may vary, but the most common are five meters long, five meters wide and four meters tall, i.e. 100 cubic meters; sufficient room to store 40,000 kilograms of pods. This room will always have a narrow door and a window located near the ceiling, both of which must be hermetically closed after the operation of filling the deposit is concluded. The pods are first shoved in through the door and, later, through the window, which is then sealed with clay. Another process-just as good for conserving the pods for a very long time, approximately three years, consists of storing the pods stratified in sand, in places known as “colca.” The process consists of placing a fine sand layer on the ground, and on top of it a layer 20 to 25 centimeters thick of well-dried pods. On top of this, a new layer of sand is deposited. Then come new layers of pods, alternated with sand layers. In Brazil the best way of storing P. juliflora pods is in sheds covered with wood on the floor and on the walls, to avoid contact of the fruit with these parts; also barns and sacking are used, according to Alves (1972). In the case of sacking, wooden rods or stakes must be placed over the floor piling up the sacks on them, taking care of leaving air circulating between the stacks, as ventilation is an important factor in conserving the pods, as Barros et al. (1981) point out. During the storage period, the pods are prone to very damaging insect attack. To prevent this, it is necessary to fumigate the storage places once they are filled or almost filled with pods. Gomes (1961) reports that fumigation with bisulfuride contributes decisively to pod conservation. In the state of Rio Grande do Norte, Nobre (Nobre, F. V., personal communication, 1982) reports that he conserved six tons of P. juliflora pods for 14 months, fumigating three times with phosphine during the storage period. The multiple uses offered by P. juliflora gained it public acceptance in the Northeast, making it a plant of recognized economic value. Among its most common uses, is the production of hard wood for mosaics, boards and sleepers; good-quality firewood; coal; stakes for fences; pods for animal and human consumption, and alcohol. With regard to these aspects, research has but barely begun. However, there are some indications as to the great value of this leguminous plant for afforestation projects, for human and animal consumption and as support for apiculture. It does not take a forester to observe the absolute lack of forest reserves, in the Northeastern semi-arid region, capable of supplying wood for construction, sleepers, stakes and poles for fences, and even firewood and charcoal, except for one or other minor forest stand. Jurema and Mororó continue to be the sole suppliers for firewood and stakes, as Azevedo (1959) points out. Reforesting the Northeast with tree species not adapted to low or irregular rainfall is difficult and non practical. But P. juliflora thrives well on poor, saline and rocky soils, spreads easily and grows fast, as pointed out by Azevedo (1955), Borba (1970), Alves (1972) and Duque (1980). The species manages to get through long dry periods without shedding its leaves and with satisfactory product output, a feature not commonly found among the species of the Brazilian Northeast. Azevedo (1955) points out that P. juliflora appears to be a boon for afforestation projects, on account of its being a drought-hardy, fast-growing species which reaches its adult stage in a mere three years and produces fine wood for a wide range of uses. Borba (1970) states that in the case of the semi-arid Northeast, where man has not yet become aware of the true role of the forest in animal life, only a tree of proven economic value would insure a successful forest policy, and his opinion is backed by a number of other experts in advocating P. juliflora as the basis for this policy. Alves (1972) recommends for the driest region in the State of Paraíba —the old cariris— the cultivation of native and exotic species, with special emphasis on P. juliflora, which can thrive with little annual rainfall, thus justifying the preference for this species in afforesting that region. Experience has shown through the existing plantations how beneficial the introduction of P. juliflora has been to the environment. Gomes (1961) believes it might be the ideal tree for the Northeastern semi-arid region. As regards the value of P. juliflora as a producer of firewood and fence stakes, Nobre (1981) reports that in surveys made with 600 samples of approximately five years of age, in the State of Rio Grande do Norte, 1.5 cubic meters of firewood and 13 two-meter-long stakes were obtained per tree. Lima and Galvão (1984) report that on a competition experiment carried out at the Petrolina region, Pernambuco, between P. juliflora and Leucaena, planted at 3 × 2-meter spacing, a timber volume of 7.2 and 7.8 cubic meters per hectare was recorded, respectively. The plants were three years old, but under the experiment's conditions, P. juliflora showed signs of entering stagnation of its growth. P. juliflora wood is hard, heavy and compact, with medium to thick texture and light brown to dark brown coloration. Its specific weight varies from 0.8 to 0.9, with shearing perpendicular to grain occurring at 5,400 kilograms for a 0.26-m-long piece between supports, and resistancce to perpendicular compression in the proportional limit is very near 970 kilograms per square centimeter, according to Valdivia (1972). P. juliflora is a highly versatile tree that produces wood for multiple uses. The use of P. juliflora pods for human consumption dates from far back. Azevedo (1965) and Gomes (1977) report that when the Spaniards arrived in South America, especially in Peru, Chile and Argentina, they found that the indians included P. juliflora pods in their diet. The chroniclers of those days, Gomes (1961) says, referred to the extraordinary importance of P. juliflora stands for the indians, as they used to feed on their pods during times of need. He also states that many times the Spaniards themselves ate P. juliflora pods, giving them also to their horses. Both honey and bread were made from the pods, according to Azevedo (1965), and the Spaniards used these to stave off hunger as they moved into Chile and Peru. Consumption of these pods by people can still be observed in South America. Azevedo (1965) reports that in Buenos Aires several commercial shops offer P. juliflora products and that at any typical restaurant in Lima, Peru, one may find “algarobina cocktail” in their menus, a beverage considered by Gomes (1961) as good for the stomach, with vitalizing and aphrodisiac effects. Herbero et al., quoted by Barros (1981), report that a rich and delicious flour can be made from pulverized pods from which the seeds have been removed. This flour is used in the preparation of sweets. The cotyledons and embryos, when pulverized, yield a flour rich in protein and sugar appropriate for diabetic people. In Brazil, the use of P. juliflora pods in human diet is not common. Gomes (1961) explains that in the old cariri, in the State of Paraiba, unripe P. juliflora pods are eaten in a similar fashion as green beans. In Rio Grande do Norte, Agronomist Guilherme de Azevedo reportedly offered his guests food items made from P. juliflora pods at a rural party in Acu; the food items were much favored by the guests. Recently, several demonstrations were made in rural areas of the State of Rio Grande do Norte, regarding the preparation and utilization of liquor, syrup, cocktail and “coffee” made from P. juliflora pods; these are consumed not only locally, but also sold in the capital city, Natal. emrater/rn, through its Social Welfare Agency, will train field teams to reach local communities to use P. juliflora pods as a foodstuff for human consumption (embrater, 1981). While visiting Peru and Argentina, Azevedo (1965) collected some recipes based on P. juliflora pods, and then tried to adapt some of these food items to Brazilian conditions giving them national names, replacing, for instance, “patay” by flour, “anapá” by refreshment and “aloja” by aluá. P. juliflora syrup —thick, dark and with consistency similar to that of honey— is widely used in the north of Peru to nourish children, elderly and sick people. The famous “algarobina cocktail” is prepared with this syrup. It is commonly mixed with milk (one to two spoons for a cup of milk), fruit (especially banana), corn flour or manioc. Once cool, keep it in well-sealed bottles; if possible, sterilized and dry. Tighten the cork of the bottle as much as possible. Good quality brandy or cognac, depending on the alcoholic content desired. Oven-dried flour ferments easily; therefore, it must be consumed immediately. It is an alcoholic beverage brewed through the fermentation of must from P. juliflora pods. The “aluá” thus obtained must be consumed immediately; otherwise it will spoil. Theoretically, 100 kilograms of pods produce approximately 54 liters of brandy. P. juliflora pods are the basis for some good food items for human consumption. Knowledge regarding the utilization of P. juliflora as a source of animal feed is much wider, as its pods have long been used as feed for bovines, equines, ovines and caprines, as Gomes (1961) points out, particularly in Peru, Argentina, Colombia, Venezuela and Sudan. Several authors, among them Correa (1926), Azevedo (1955), and Gomes (1961), state that P. juliflora foliage is first-quality fodder and that it will, in the near future, become a very important and even essential item in Northeastern agriculture. But according to Alves (1972), its use is not widespread. Allowing the herds to feed directly on leaves and pods is out of the question, as this practice inhibits plant development almost completely and P. juliflora foliage is not particularly palatable to livestock. The author points out that in prolonged droughts, the effort made by the animal in order to eat it is evident, concentrating only in the tenderest parts of the tree. Thus, the great value of P. juliflora as fodder is in its pods. Besides being a source of energy and having great protein value. P. juliflora pod can be produced advantageously, from ecologic and economic points of view, in the farm itself, even in years of abnormal rainfall rates, according to Azevedo (1960). During his field trip through Peru, Chile, Argentina and Uruguay, Azevedo (1957) observed that, generally, P. juliflora pods are used in concentrated rations for dairy cows at a ratio of approximately 40% to 60%. He also mentions its inclusion in rations for beef cattle, mules, pigs, sheep and fowls. Gomes (1961) reports that in Hawaii some farms produce more than 1,000 tons of P. juliflora pods per year, using them for cattle rations, particularly for dairy cows, replacing several concentrates, especially cotton seed flour. Wilcos, quoted by Duque (1980), points out that P. juliflora is recognized as one of the most valuable fodders introduced in Hawaii, where its pods are good even for fowls. Still in Hawaii, Henke, quoted by Duque (1980), studying P. juliflora ground pods to feed pigs, concluded that in spite of their good quality, they did not match standard rations. Diaz (1962), quoting Castañeda Vega, explains that feed rations based on P. juliflora pods keep dairy cows well nourished in the Argentine provinces where rainfall is scant, such as Catamarca and La Rioja. Still in Argentina, Inchausti and Tagle, quoted by Nobre (1981), point out that, in terms of nourishing value, P. juliflora pod are somewhat lower than corn, equal to barley and higher than oats. They recommend that it not be administered as the only concentrate, due to its richness in sugars and relative poverty in protein. They also suggest that it should be mixed with other feeds or used as top feed to good herbages. P. juliflora pods present good nutritive value and high palatability to bovines, caprines and ovines, which ingest them readily and without any related inconvenience, as Azevedo (1960) reports. Table 1 below shows the results of a bromatologic analysis obtained by several authors. Variations may be observed in the components of P. juliflora pods, but what matters now is to show its value in terms of nutritive components. Barbosa (1977) studied the digestibility of P.juliflora pods in Minas Gerais. He studied rams fed whole pods; whole pods heated up in oven at a temperature of 80° C for two hours; ground pods, and pods warmed up in the oven and ground immediately thereafter. Pod digestibility was, for the different components at at each treatment, respectively, as follows: 73.5%; 71.9%; 67.5%; 71.6%, for dry matter; 72.0%; 70.3%; 67.0% and 70.0% for raw energy; and 69.0%; 67.1%; 62.4%, and 67.8% for raw protein. For the nitrogen balance, the author obtained the following values: 1.3; 0.9; 1.9 and 0.3 grams. Relatively little research has been conducted in Brazil and elsewhere aimed at making feasible the utilization of P. juliflora pods as feed for bovines, although these pods are recommended for beef and dairy cattle. In the State of Rio Grande do Norte, Nobre (1981) studied four levels (0%, 20%, 40% and 60%) of replacement of wheat flour by P. juliflora pod flour in rations for milk cows in lactation, and found that as the proportion of P. juliflora pod flour increased and that of wheat flour decreased, milk production and weight gain also increased, and there was also a trend to increased dry matter ingestion, digestible protein and total nutrients. He points out that the most economic ration was the one with 60% P. juliflora pod flour replacing wheat flour. Similar studies were conducted by Silva (1981) in the State of Paraíba, with beef cattle of the Nelore breed. The author studied five levels (0%, 25%, 50%, 75% and 100%) of wheat flour replacement by P.juliflora ground pods. The best results, in terms of weight gain, were observed with the 0% and 100% levels, concluding that it is biologically and economically feasible to replace wheat flour with P. juliflora ground pods. P. juliflora is a fodder tree of excellent quality for feeding almost all kinds of livestock. Research studies regarding the value of P. juliflora pods as feed for ovines are still scant. Buzo et al. (1972) conducted research in Mexico with muttons, progressively replacing sorghum grain with P. juliflora pod flour in their rations at 0%, 15%, 30%, 45% and 60%. All diets containing P. juliflora pod flour showed greater weight gain, except that with 60%, where weight gain was lower than with the remaining levels of substitution. The authors report that feeding costs were reduced with the inclusion of P. juliflora pod flour, stating that the best level of substitution was 45%, which resulted in an economy of approximately 30%. In the town of Viçosa, State of Minas Gerais, Barbosa (1977) studied the nutritive value of P. juliflora pods through digestibility trials, using rams. The study included the utilization of P. juliflora pods as a foodstuff, both by themselves and associated with elephant grass (Pennisetum purpureum Schum), with the purpose of determining feed intake, apparent dry matter digestibility, raw energy, crude protein and nitrogen balance. Additionally, he studied the possible effects grinding and heating might have on P. juliflora pod nutritive value. The author concluded that voluntary intake of P. juliflora pods, as the only feed item, was not influenced by either grinding or heating up of the pods. However, ground pods associated with elephant grass were eaten in greater volume than whole pods. As regards P. juliflora pod dry matter digestibility, he found it to be higher than that for corn sorghum and sisal silage, thereby indicating that P. juliflora pods may represent a valuable fodder resource for ruminants in the Northeastern semi-arid region. Barros (1981), in the State of Paraíba, studied the effects of replacing 0%, 15%, 30%, 45% and 60% of sugar cane molasses with Prosopis juliflora pods in ram rations, and found greater weight gains for the 30% and 45% levels. Despite the scant references in literature regarding P. juliflora pod use in pig rations, Gomes (1961) observed that, in Peru, a pig consumes from one to two kg of these pods per day, as reported by agronomist Victor Baca, from Peru's Ministry of Agriculture. Viégas, quoted by Gomes (1977), reports, in turn, that intake of these pods ranges from 2 to 3 kilograms per day. Pigs fed on rations containing 70% of flour made from sun-dried P.juliflora seeds and 64% kilo-dried seeds, gained 595 and 257 grams per day, respectively, according to research conducted by Henke in Hawaii, as quoted by Alba (1958). Literature contains reports on P. juliflora pod consumption by equines, mules, donkeys, goats and domestic fowl. However, no research studies have been conducted in Brazil to lend support to these reports. Gomes (1961) reports that the Spaniards are these pods on many occasions while in South America, feeding them also to their horses. He also informs that present-day horses and mules in Peru receive from 2 to 6 kg of P. juliflora pods in their daily rations. Brazilian flora is so rich in melliferous plants that even those species not detected or not recognized as a source of nectar or pollen also lend their contribution to the production of honey or pollen. There are practically no studies on these plants in the Northeast, and knowledge on them, including their flowering season and their value as nectar and pollen suppliers, would be a must for increasing honey output and for an increased overall agricultural output. Dry areas, such as the Brazilian Northeast, are known to be a write-off for apiculture. But enter Prosopis juliflora, a species which, flowering throughout the year, cannot be overlooked by the bees, and the outlook changes. When there is no vegetation bearing flowers in the Northeastern hinterland, Prosopis juliflora is covered with its pale-yellow blossoms, which are more abundant in the rainy periods, as Azevedo (1955) points out. This quality of Prosopis juliflora, according to Burkart (1943), must be considered when evaluating this legume for the Northeastern semi-arid lands. In India, in whose arid lands Prosopis juliflora plantings are widespread, Kunhikannau, quoted by Burkart (1943), calculates that from a flowering tree bees may extract enough nectar to produce over one kilogram of honey; and, in one hectare, the bees may find nectar for 100 to 400 kilograms of honey; naturally, this depends on the spacing at which the trees were planted. Flowering P. juliflora is excellent for honey production. Based on the assertions of most of the authors consulted, it may be concluded that the remarkable economic and physiological characteristics of Prosopis juliflora —such as its extraordinary resistance to drought, precociousness, ability to thrive in highly saline or poor soils, and the palatability of its pods to various livestock species, particularly bovines, equines and ovines— make this legume a prime contributor to the development of the Northeastern region. * During the entire International Conference on Prosopis, at coffee breaks, all “coffee,” sweets, biscuits and ice-cream offered the participants were prepared with P. juliflora pods. They were excellent, and were relished by everyone (Ed.). alba, j., 1958: “Alimentación del ganado en la América Latina,” México, df, Editorial Fonrier, 336 p.
alves, a.q., 1972: “Algaroba, una experiencia válida,” João Pessoa, Secretaria da Agricultura, Indústria e Comércio, Departamento de Produção, 20 p.
alves, j., 1981: “Consórcio de plantas forrageiras para as regiões do semi-árido da Paraíba,” João Pessoa, Ministério do Interior, dnocs, 29 p.
azevedo, g., 1955: “Algaroba,” Natal, Ministério da Agricultura, Serviço do Acordo do Fomento da Produção Animal, 13 p.
azevedo, g., 1960: “Algaroba,” Rio de Janeiro, Ministério de Agricultura, Serviço de Informação Agrícola, 34 p. (Ministério da Agricultura, sia, 843). azevedo, g., 1982: “Como e porque a algarobeira foi introduzida no Nordeste,” In: Simpósio Brasileiro sobre Algaroba, 1, Natal, 1982. Proceedings… Natal, emparn, V. 1. pp. 300–06. azevedo, g., 1959: “Pastos arbóreos,” Rio de Janeiro, Ministério da Agricultura, Serviço de Informação Agrícola, (Ministério da Agricultura, sia, 791). azevedo, g., 1957: “Relatório de viagem ao Peru, Chile, Argentina Uruguai,” (Mimeographed). azevedo, g. 1965: “Vagens da algarobeira na alimentação humana,” Mundo Agrícola, São Paulo, 15 (169): 53–4. 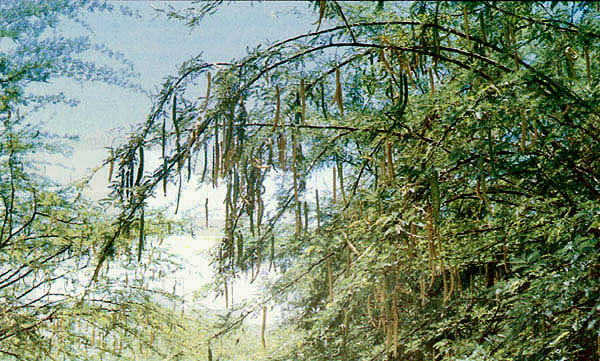 barbosa, h.p., 1977: “Valor nutritivo da algaroba (Prosopis juliflora (Sw) dc) através de ensaio de digestibilidade em carneiros,” Viçosa, Universidade Federal de Viçosa, Escola Superior de Agricultura, 48 p. (M. Sc. Thesis). barros, n.a.m.t., 1981: “Algaroba, uma opção válida para o Nordeste seco,” Natal, Universidade Federal do Rio Grande do Norte, Centro de Tecnologia, Departamento Agropecuária, 81 p. (Mimeographed). barros, n.a.m.t., 1981: “Efeitos da substituição do melaço por vagens de algaroba (Prosopis juliflora (Sw) dc) na alimentação da ruminantes,” Areia, Universidade Federal da Paraíba, Centro de Ciencias Agrárias, 97 p. (M. Sc. Thesis). barros, n.a.m.t. et al., 1981: “Algarobeira, importante forrageira para o Nordeste,” Natal, emparn, 34 p. (Technical Bulletin, 5). borba, f., 1970: “Algarobeira e política florestal para o Nordeste,” Brasil Florestal, 1 (4) : 15–6. burkart, a., 1940: “Materiales para una monografia del género Prosopis (Leguminosae),” Darwiniana, Buenos Aires, Imprenta Cara Ed. Coni, 4: 57–128. burkart, a., 1943: “Las leguminosas argentinas silvestres y cultivadas,” Buenos Aires, acme Agency, 590 p.
buzo, j. et al., 1972: “Efecto de la substitución progresiva de sorgo por vaina de mezquite en la alimentación de los borregos,” Técnica Pecuária en México, df, 20: 27.
campos, j., 1980: “Tabelas para cálculos de rações,” Viçosa, Universidade Federal de Viçosa, Imprensa Universitária, 62 p.
carvalho, m.b. et al., 1968: “O serrador, praga da algarobeira,” Rev. fir, Rio de Janeiro, 10 (10): 38–9. carvalho, r.f., 1963: “A Algarobeira,” Anuário dos Criadores, São Paulo 10, 4 (4): 195–9. correa, m.p., 1926: “Dicionário das plantas úteis do Brasil e das exóticas cultivadas,” Rio de Janeiro, Imprensa Nacional, V. 1, pp. 68–9. costa, b. Marques da, et al., 1973: “Forrageiras arbóreas suculentas para formação de pastagens,” Cruz das Almas, ba, Instituto de Pesquisas Agropecuárias do Leste, 24 p. (Circular, 34). diaz, h.b., 1962: “Especies arbóreas más comunes de las zonas ganaderas de la Provincia de Tucumán que sirven de alimento al ganado,” Turrialba, 12(4): 195–9. duque, j.g., 1980: “O Nordeste e as lavouras xerófilas,” 3rd Ed. Mossoró (rn), Escola Superior de Agricultura, Fundação Guimarães Duque, p. 289–93 (Coleção Mossorense, 153). embrater, 1981: “Algaroba - mais do que alimento,” Rev. Bras. Ext. Rural, Brasília, 2 (2): 20–1. gomes, p.a., 1961: “A Algarobeira,” Rio de Janeiro, Ministério da Agricultura, Serviço de Informacão Agrícola, 40 p. Ministério da Agricultura, (sia, 865). gomes, p.a., 1977: “Forragens fartas na seca,” 4th Ed. São Paulo, Nobel, 223 p.
gomes, p.a., 1964: “Plante seu algarobal,” Seleção Agrícolas, 19 (222): 43–4. gomes, p.a., 1964: “Vantagens da Algarobeira,” Rev. dos Criadores, Sãao Paulo, 35(409): 20–2. guerra filho, d., 1963: “Algarobeira vai mudar paisagem do Nordeste,” Anuário Bras. Econ. Florestal, Rio de Janeiro, Instituto Nacional do Pinho, 15(15): 109–12. lima, a.m.c., 1985: “Coleópteros.” in: Insetos do Brasil, Rio de Janeiro, Escola Nacional de Agronomia, 259 p.
lima, p.c.f. and galvao, a.p.m., 1984: “A pesquisa com algarobeira desenvolvida pela embrapa/ibdf no Nordeste Semiarido,” Brasília, embrapa, ibdf, 21 p.
little, a. and wadsworth, f., 1964: “Common trees,” Washington, d.c. u.s. Department of Agriculture, 548 p.
marcilio junior, j., 1960: “Algaroba,” Bol. da Agricultura, Belo Horizonte, 9(5–6): 9–16. melo, f., 1966: “Agricultura nordestina, os problemas agropecuários do Nordeste seco,” Mundo Agrícola, São Paulo, 15(170): 39–51. moraes, g.j. et al., 1981: “Insetos associados a sementes de forrageiras e essencias florestais no trópico semi-árido do Brasil,” Petrolina (pe), embrapa, cpatsa, 2 p. (embrapa, cpatsa, Research in progress, ii). nobre, f.v., 1981: “Substituição do farelo de trigo (Triticum vulgare) pelo fruto triturado da Algarobeira (Prosopis juliflora (Sw) dc) na alimentação de vacas em lactação,” Areia (pb), Univ. Fed. da Paraíba, Centro de Ciencias Agrárias, 51 p. (M. Sc. Thesis). pimentel, m.l., 1982: “Extração de sementes de Algarobeira (Prosopis juliflora (Sw) dc) attravés de processo químico,” in: Simpósio Brasileiro sobre Algaroba, 1, Natal, Proceedings… Natal, emparn, V. 1, p. 330–8. piza junior, s., 1977: “Um novo proscopiideo do Nordeste Brasileiro (Orthoptera),” Rev. da Agricultura, Piracicaba, 52(1): 1–3. ponte, j.j., 1964: “Algaroba, (Prosopis juliflora (Sw) dc) - uma hospedeira de Meloidogyne Hapla chitwood,” 1949, Bol. Soc. Agron., Fortaleza (ce), 5: 63–5. ramalho, f.s., 1972: “Nota sobre o «serador» da Algarobeira - Oncideres saga de Dalman, 1923 (Coleóptera, Cerambyciadae),” Pesq. Agrop. Nord., Recife, 4(2): 11–2. santos, j.m. and silva, h.d., 1983: “Suscetibilidade de éspecies florestais á Meloidgyne javanica na região semi-árida do Nordeste,” in: Símposio iufro em melhoramento genético e produtividade de espécies florestais de rápido crescimento,” Aguas de São Pedro, Silvicultura, 8(3): 377–9. silva, d.s., 1981: “Substituição progressiva do farelo de trigo pela vagem da algaroba na alimentação de bovinos em engorda,” Areia (pb), Universidade Federal da Paraíba, Centro de Ciencias Agrárias, 51 p. (M. Sc. Thesis). souza, j.c., 1965: “Um milagre no Nordeste,” Agricultura e Pecuária, Rio de Janeiro, 36 (491): 51–2. souza, s.m. et al., 1983: “Sementes de algaroba: Métodos e custos de beneficiamento,” Rev. Bras. Sem., Brasília, 5(3): 51–61. valdivia, s.v., 1972: “El algarrobo, una especie forestal prometedora para los trópicos áridos,” Peru, Ministry of Agriculture, 4 p. (Bol. de Divulgacão, 32).